Overnight Tuesday Night: Storms depart south early. Lows in the 50s. Wednesday: Lots of clouds, much cooler. Highs in the 50s coast, 60s inland. Thursday: Mostly sunny with highs in the mid to upper 70s, 60s coast. Tornado watches and warnings were active for much of Tuesday in three New England states, but all had expired by the evening. The warnings were in effect in parts of Connecticut, Massachusetts and Vermont. Severe thunderstorm watches and warnings were also in effect in much of New England throughout Tuesday. Click here to see the latest weather advisories. If your neighborhood is in a tornado watch, remain weather aware by keeping up with the forecast and the latest radar and be prepared to immediately seek shelter in the lowest level of a sturdy building if a tornado warning is issued. Those warnings will be issued if a tornado is confirmed or imminent. 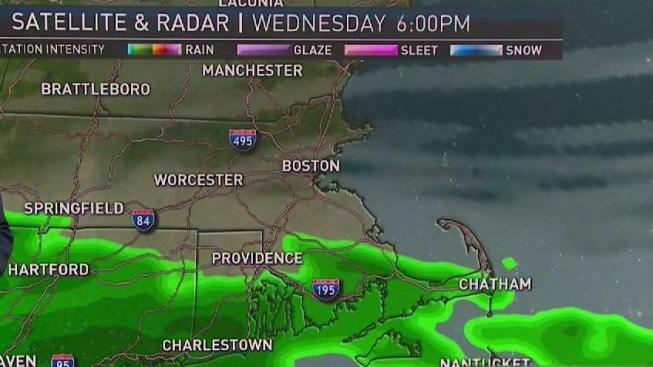 Showers will precede the storms for some in central New England, while no severe weather is expected in northern New England, where numerous showers are falling with embedded thunder. As thunderstorms swept through the region, power was knocked out to many. More than 130,000 customers were without power in Connecticut as of 8 p.m., with more than 3,300 in Massachusetts. Storms will depart overnight, leaving fog for some and cooler air on Wednesday, with highs only in the 50s east and 60s west with lots of clouds. After a fair and pleasant Thursday, Friday brings advancing rain from the south by late day into the night, likely to last with cool temperatures through Saturday before breaking up into showers Sunday, allowing temperatures to rebound a bit for the end of the weekend. Our exclusive Early Warning Weather 10-day forecast puts temperatures in the 70s for the start of next week. Stay up to date with the NBC10 Boston and necn apps.